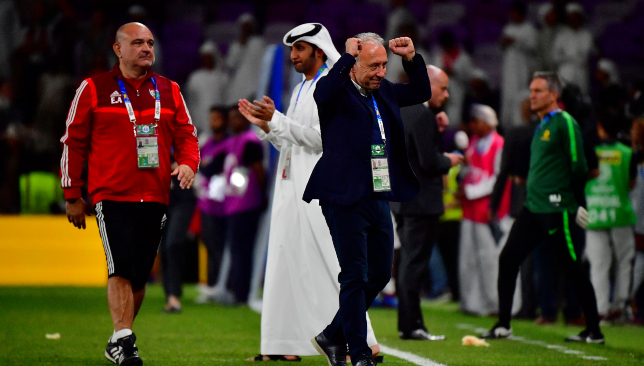 Hosts the UAE exhibited a “champion’s character” to eliminate holders Australia and march into Asian Cup 2019’s semi-finals, according to coach Alberto Zaccheroni. The dogged Whites ceded possession and chances to exalted opponents who beat them in 2015’s last-four. But encouraged by partisan support at a raucous Hazza bin Zayed Stadium, a suicidal back pass from Al Hilal-bound centre-back Milos Degenek was intercepted by Al Jazira predator Ali Mabkhout and he rolled into an open net – to become the competition’s joint-third all-time top scorer on nine strikes from 11 appearances – after goalkeeper Mathew Ryan was confidently rounded on 68 minutes. This moment, allied with indomitable defending throughout from the likes of veteran Ismail Ahmed, saw a meeting secured against Qatar on Tuesday at Mohammed bin Zayed Stadium. “It is a deserved victory over a champion in Australia,” said Zaccheroni, who remains on course to achieve a repeat of 1996’s run to the decider during the last time the Emirates put on the event. “As I mentioned earlier in the pre-match press conference, Australia is very strong and organised. They play very well tactically, they are stable with their formation and the players they keep in the squad. “Since I assumed responsibilities, I changed the squad many times because of injuries. Today, the UAE showed their great character – a champion’s character. “We defended well and attacked well. We were suffering from aerial balls, but we fought well and won the match. The Whites came into the tournament under a cloud. A final friendly loss to Kuwait made it just six victories in 18 matches under Zaccheroni. Against Graham Arnold’s remodelled Australia, they gained only 36-per-cent possession and had seven attempts to their opponents’ 22. But it would be incorrect to tag this victory as lucky. They defended courageously and ruthlessly converted their best opportunity. The weekend’s result saw the UAE eliminate the champions at the quarters for the second-successive tournament. Japan were their victims, under Mahdi Ali, in 2015 at Stadium Australia. Mabkhout was also on the score sheet that night. The 28-year-old’s latest effort also moved him onto an impressive 48 goals in 78 internationals, of which four have come in five matches during this edition. His exploits earned special praise from Zaccheroni. He said: “Everyone agrees that Mabkhout is a high-calibre striker and big player, his performance tonight was great. This victory, however, came at a cost. 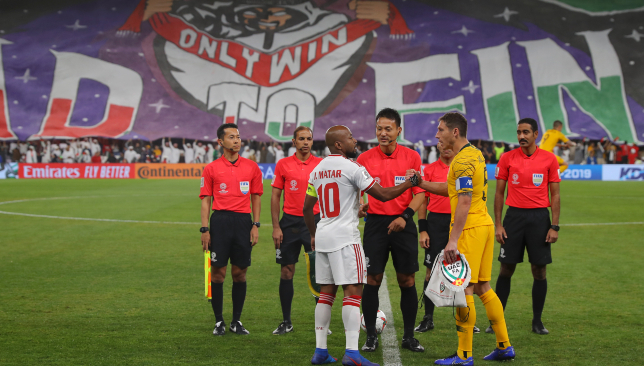 Al Ain right-back was stretchered off in the early stages with an apparent serious knee injury, Al Jazira centre-back Fares Juma had to have repeat treatment for concussion in the stretched final throes and buccaneering right winger Bandar Al Ahbabi further suffered a muscle problem. “I do not have any updated information about the injured players, due to the short time we’ve had,” said Zaccheroni, who previously lost Al Nasr centre-back Khalifa Mubarak to injury against Kyrgyzstan in the round of 16 and has been without superstar playmaker Omar Abdulrahman – who watched on in the Garden City – for the entire running. “After the press conference, we’ll contact the doctor of the national team and we’ll assess the injured players – Bandar Al Ahbabi, Mohamed Ahmed and Fares Juma. 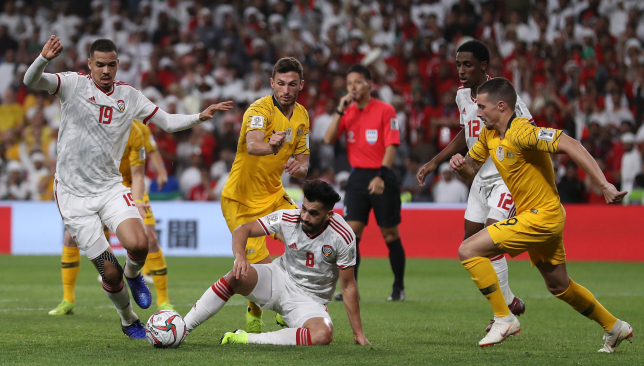 Hosts UAE stunned holders Australia after Ali Mabkhout gratefully accepted a gift from Milos Degenek, sending the former through to Asian Cup 2019’s semi-finals with a surprise 1-0 victory. 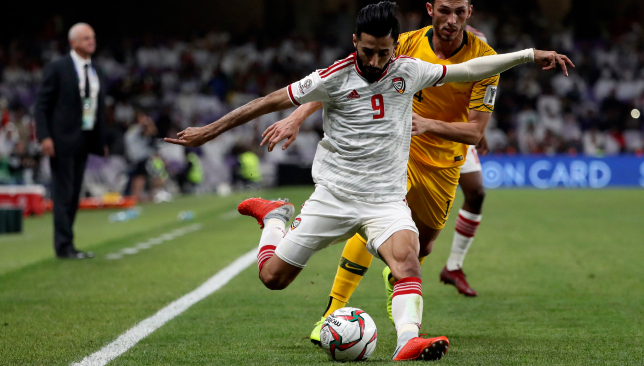 Buoyed by a cauldron atmosphere at Hazza bin Zayed Stadium, the Socceroos dominated possession and attempts on goal against the side they defeated in 2015’s last-four. But their inaccuracy at both ends on Friday night proved critical when Al Hilal new boy Degenek’s shocking back pass under pressure from substitute Mohamed Abdulrahman allowed the previous edition’s top scorer, Mabkhout, to round goalkeeper Mathew Ryan and slot into an open goal on 68 minutes. Alberto Zaccheroni’s Whites then defiantly held out, even after 10 minutes of added time. They will now meet Qatar on Tuesday at Mohammed bin Zayed Stadium. 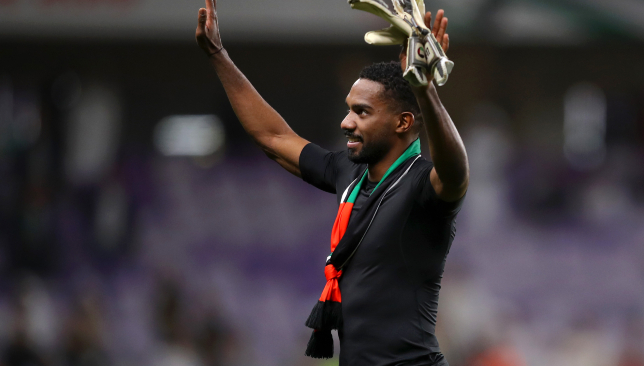 Khalid Essa – 7: Al Ain goalkeeper was not unduly worked on home soil. The comically wasteful Socceroos produced just two shots on target from 22 attempts. Mohamed Ahmed – 5: Crunched into a challenge out wide early on and was substituted for Al Jazira youngster Khalifa Al Hammadi. Let’s hope the injury is not too serious. Ismail Ahmed – 8: Towering. As always. 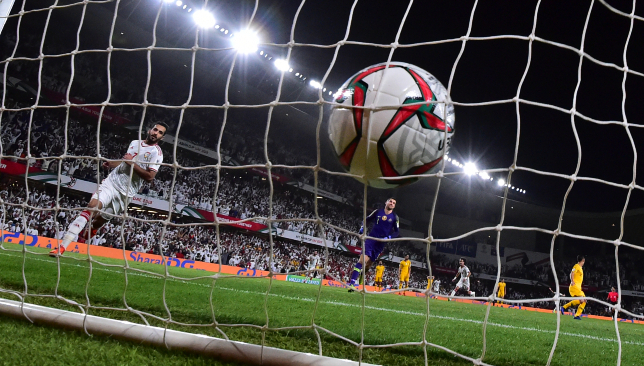 When Australia went long, the Al Ain stalwart was there to nod the ball to safety. Fares Juma 7: On the ground he used to call home, the Al Jazira centre-back fitted in seamlessly for the injured Khalifa Mubarak. Made one acrobatic clearance in the first half, plus – questionably – returned to the pitch when apparently concussed. Walid Abbas – 7: A first run-out at Asian Cup 2019, predictably, did not unsettle the Shabab Al Ahli Dubai Club stalwart. Can always be relied upon to perform. Majed Hassan – 7: Was saved by the linesman’s flag after a sloppy second-half giveaway. Other than that, injected much-needed energy into the UAE XI. Ali Salmeen – 6: The Al Wasl man’s passing wasn’t always crisp. But he sensed danger on the pitch and plugged essential gaps. Bandar Al Ahbabi 5: Pushed up from right-back to fit it more-defensively minded Al Ain club-mate Mohamed Ahmed. Did a job, without excelling. 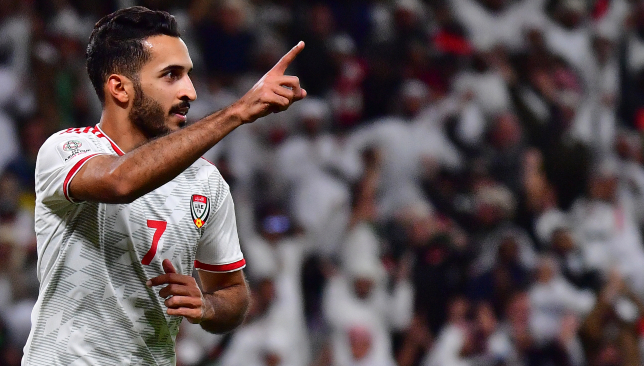 Ismail Matar – 5: At 35-years old, the Al Wahda and UAE icon still exhibited a few nice touches. Was hooked shortly after half-time for Mohamed Abdulrahman. Ismail Al Hammadi – 5: Another frustrating match for the Shabab Al Ahli winger. Missed a glaring opportunity in the 21st minute when he expertly dribbled past Milos Degenek, yet shot straight at Mathew Ryan. Ali Mabkhout – 7: A curious tournament continues for the 2015 edition’s leading marksman. Wasted a few good chances and touch was awful, but gobbled up Degenek’s shocking back-pass. That’s four goals in five games in 2019. Khalifa Al Hammadi – 7: The 20-year-old was thrown on after Mohamed Ahmed’s injury. Just like at the 2017 Club World Cup, was undaunted upon his competitive international debut. Mohamed Abdulrahman – 7: Essential pressure on Degenek handed Mabkhout a gift. Injured superstar brother Omar would have loved that, watching from near the dugout. Saif Rashid – N/A: Sharjah winger was thrown on to wind down the clock and offer a threat on the break. Mathew Ryan – 7: Brighton & Hove Albion goalkeeper was left stranded by Degenek’s moment of madness. Otherwise, stood tall to deny Al Hammadi. Rhyan Grant – 7: Offered a constant outlet on his flank. The tournament’s outstanding right-back enhanced his reputation. Trent Sainsbury – 7: His standing as the continent’s outstanding centre-back was not unduly harmed as he kept Mabkhout at arm’s length. PSV Eindhoven star could do nothing about the goal. Milos Degenek – 3: A poor tournament reached its nadir when he panicked when harried by Mohamed Abdulrahman and put Mabkhout in the clear. Al Hilal might want to check the return policy for their new signing. Aziz Behich – 6: PSV left-back was dependable without ever excelling. Story of his Socceroos career, by and large. Jackson Irvine – 5: Arnold had a choice between Irvine’s energy and Luongo’s accuracy. Went for the former, without gaining reward. Mark Milligan – 5: The ex-Bani Yas player was not at his best. Failed to enhance Australia’s build-up play. Chris Ikonomidis – 5: Has been one of the tournament’s outstanding players and an assist machine. Was unable to get going on Friday evening after his swap to the right flank. Robbie Kruse – 5: His status as an XI pick appeared to have been ended by Awer Mabil. Arnold’s decision to swap the two around did not come off. Apostolos Giannou – 7: The AEK Larnaca forward justified his place in the side. Slotted in after the hour mark, only for linesman’s flag to intervene. Jamie Maclaren – 4: Exits the tournament with one goal to his name. The Hibernian loanee is not the answer to Australia’s problems up top. Not by a long way. Mathew Leckie – 6: Hertha Berlin winger was narrowly offside for Giannou’s ‘opener’. Made a difference. Awer Mabil – 6: Why didn’t he start? Andrew Nabbout – N/A: First minutes of tournament after injury. Improved side.